Often people think that management is the same as leadership. This is not the case. While both roles are essential in every organization, there are significant differences between the two. 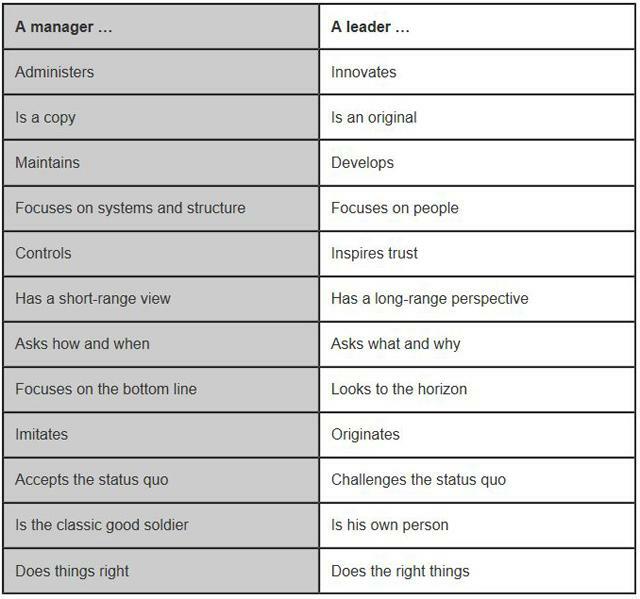 Warren Bennis an American scholar, organizational consultant and author who is widely regarded as the pioneer of the contemporary field of leadership, composed a list of the differences between a leader and a manager in his 1989 book titled “On Becoming a Leader“. In today’s workforce, people look to their managers, not just to assign and delegate tasks, but to define for them a purpose. Employees should be energized! Make them feel they are contributing to something bigger. Managers benefit from having the ability to NURTURE skills, DEVELOP talent and INSPIRE results. Therefore in today’s workforce, management and leadership are not easily separated. Every manager should aspire to lead! « What is Emotional Intelligence and why is it important?